‘La Loba’ wolf woman is the guardian keeper of all that is wild and free in us; and she is calling us back home. Calling us to feel our paws pressing into the dirt, to smell the mulched leaves and moist fertile soil of the earth. She is not afraid of the darkness, she trusts her instincts, her love is fierce and loyal. 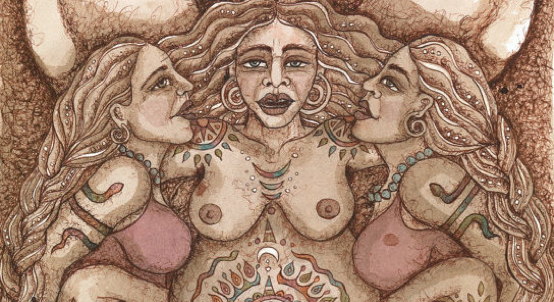 La Loba has much to teach us in the reuniting of us as women with the nature within us and the nature around us. Are you ready to awaken to her call and to run free with her in the forest? To lay together with bellies on the earth and breathe with life, to sing and howl with the moon as we remember what it is to feel totally alive, unashamed and belonging. As women we have forgotten the feminine ways of our wild and instinctual self. We have forgotten that this nature in which we live, also lives within us. We have been taught to feel shame about being this wild woman. We have been taught to be quiet and small and to be ‘nice girls’. And we have been taught to fear this wild power that thrums both in ourselves and each other. Can you feel her? The powerful Wild Woman clawing from the inside of your own skin trying to get out? The Woman who can no longer stay silently hidden in the shadows. The woman who wants to be seen in her natural beauty without apology. The Woman who lives in the body of her knowing, in the heartbeat of her breast and the pulse of her ancient womb wisdom. This Woman is being called back to life as she is profoundly needed at this time on planet Earth, she is needed for the awakening of humanity and for the protecting of our beautiful earth. This Wild Woman camp is a chance to discover what it is that your wild woman wants to show you, and what it’s like to feel her totally alive in you. Elemental and connected. Our time will be primarily spent outdoors camping. There will be a large central fire as our womb home hearth. We will keep this fire burning to hold our hearts and bodies in circle. This hearth will be the resting place for us to nurture ourselves and each others, with good food of our earth that we will share in the cooking and preparing of and hot warming drinks. It will be our roots to return to and keep the company of our soul sisters, share our stories, listen to the ancestors, pray and sing with the day and the night. There will also be a large dry warm space for us to gather in should we need it. Each day we will find difference ways we can reclaim this wildness, both within ourselves and in immersion with nature, while at the same time taking soft and tender care of our sacred bodies. This is not a place of competition or pushing. This is a place where we will co create as women, courage and kindness to help each other find our way home. Things that might be included are: dancing, singing, ritual body painting, immersion into the forest, crafting, sharing, feeling, eating, awakening our senses, stepping out of the mundane of life, opening to the feminine mystery, finding our power, leaving the good girl at home and discovering yourself as woman as you never have before. Come and join us, you won’t regret it . . La Loba is waiting and her love is calling..
Our intention is to make your experience with us as accessible as possible given women’s different financial means. The camp price is set as a not-for-profit rate. We will bring and share food, cooking together. You are also welcome to cook your own meals if you prefer. Price is inclusive of all workshops, camping and full use of the campsite facilities, outdoor kitchen equipment for cooking and living with a fire. If you are a mamma, you are welcome to bring up to 3 children under 8 years of age if boys, girls any age are welcome, but please note that there is no creche or other childcare facilities – you are asked to take responsibility for the children you bring, at all times (£15 per child up to age 16). If you would like to bring children, please contact us first as we need to know how many children will be on site.